I decided to try Mulled Wine from DavidsTea’s 2015 winter collection because of the amazing smell that the little sample cup of dried tea had in store (yes, I’m lucky enough to live close enough to get to go in person – it’s pretty awesome!). The tea has a beautiful citrus smell, which I quite like. I’m a big fan of a lot of citrus fruits, so the bright aroma of orange is quite welcoming. 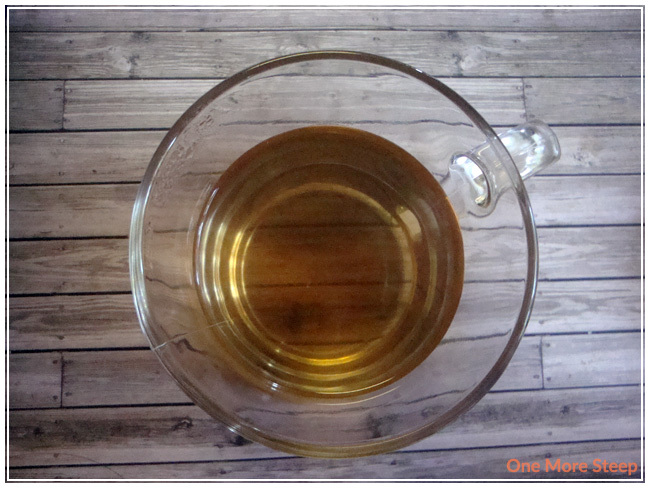 Despite this being an oolong tea, I really cannot make out the fragrance of the tea. What I can make out is oranges, cinnamon, and ginger. Mulled Wine is made up of: oolong tea, apple, orange peel, cinnamon, clove buds, ginger, and natural flavouring. The ingredients are really quite visible, the oolong seems a little overwhelmed with all of the other ingredients around it though. Hopefully the oolong taste comes out when the tea is steeped! 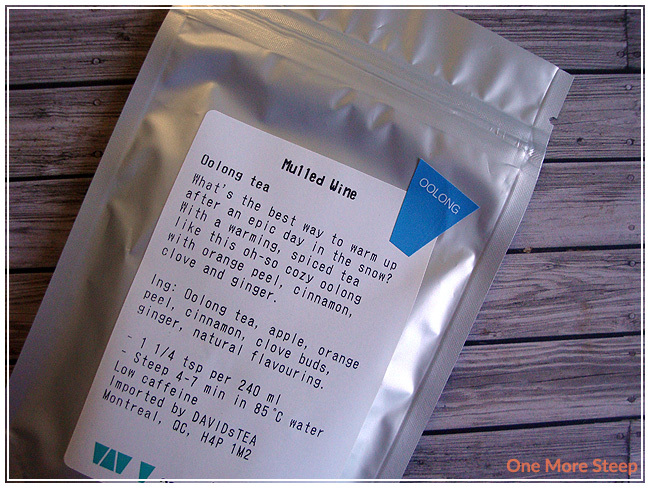 DavidsTea recommends steeping Mulled Wine in 85°C (185°F) water for 4 to 7 minutes. I went for the lower end of the spectrum of time because I find that most oolongs do pretty okay with being steeped again, so fingers crossed for Mulled Wine! Mulled Wine steeps to a lovely golden yellow, but the aroma isn’t that impressive compared to the dry leaf. I can barely make out the smell of any of the citrus, cinnamon or ginger. It actually smells a bit like oolong tea, which is quite nice considering that is the tea base. The taste of Mulled Wine is a bit confusing. There’s some notes of citrus, a little bit of the cloves comes out, but the tea itself doesn’t wow me. It’s hard to make out the oolong taste because it’s been muddled with all of the other ingredients. The citrus notes are nice, coupled with the cloves and a spicy note from the ginger. The actual oolong is underwhelming. While Mulled Wine can be resteeped and it tastes pretty much the same as the first cup, I was just not interested in it. 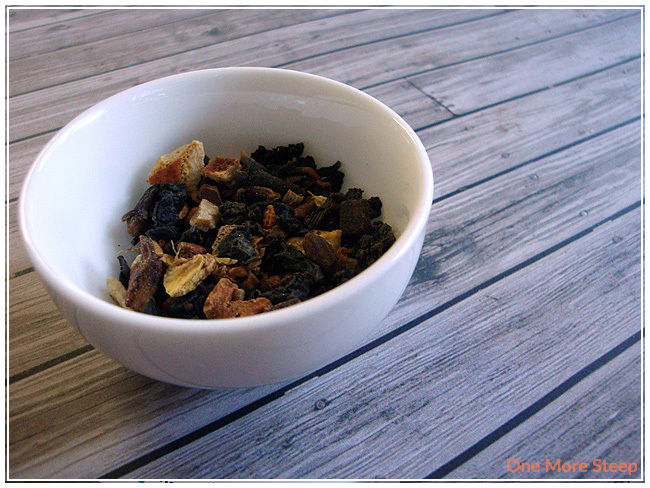 I didn’t like DavidsTea’s Mulled Wine. It’s not something I particularly enjoyed drinking. As an oolong, it doesn’t do anything for me. As a tea with notes of ginger and cloves, I think it would make a great tea for someone with a sore throat or wanting something to warm up with. For an oolong tea though, it is underwhelming and I think there are a lot more better oolong teas out there. I will probably keep the rest of my little bag around as a tea for when I’m sick because I do like the ginger taste, but it falls flat for me.